With the Video Music Awards coming up, there are a lot of artists out there that you need to be aware of. "Who is G-Eazy?" is one question that you might have, especially recently. The name of the producer, songwriter, and rapper should sound familiar because he was featured on Britney Spears' song "Make Me...," which he'll be performing with the Princess of Pop at the VMAs. However, he didn't just come out of nowhere to appear on one of the biggest tracks of the summer. Actually, G-Eazy has been around for quite a while. He began to build his brand on MySpace all the way back in 2007, with the song "Candy Girl," and has been steadily gaining momentum ever since. His real name is Gerard Earl Gillum, and he's originally from Oakland. He's part of the hip-hop scene in the Bay Area, and, at just 27, has already racked up some impressive credits. He has two albums of his own — These Things Happen, out in 2014, which peaked at #3 on the Billboard 200, and When It's Dark Out, released in 2015 — as well as a smattering of mixtapes. On top of that, he's opened for acts like Snoop Dogg and Lil Wayne. His best known songs are probably "Make Me...," of course, as well as "You Got Me" and "I Mean It," featuring Remo, which have 30 million and 150 million views on YouTube, respectively. G-Eazy also makes frequent appearances at music festivals; he's currently on tour in Europe, with stops in Germany and Poland at the end of August, and a return to the United States on Aug. 30. After almost a decade in the industry, his breakthrough into the mainstream has been heralded for a while now, but this might finally be the moment. As if working with Spears wasn't a strong enough indication, G-Eazy also got a song with Jeremih, "Saw It Coming," onto the soundtrack of the Ghostbusters reboot, which is the hottest ticket in town right now. 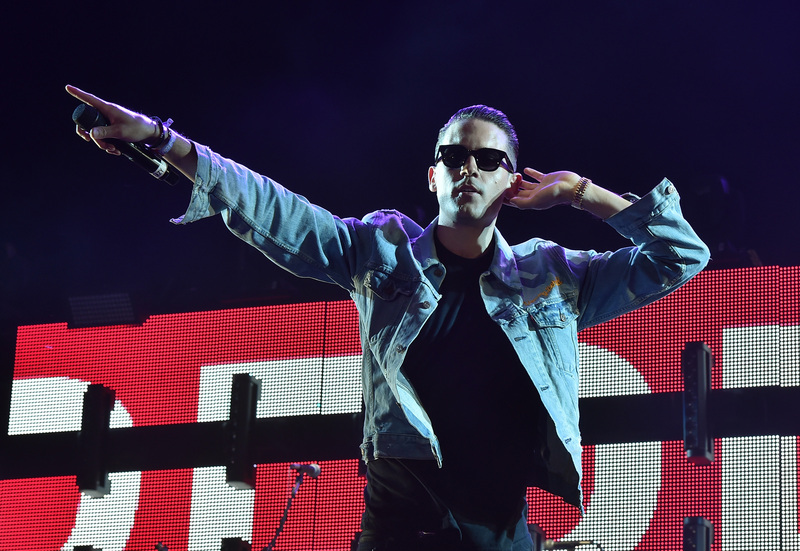 However, he also hasn't been just sitting around waiting to become a household name; unlike many artists who are similarly on the brink of mass success, G-Eazy made education a priority. Juggling his mixtapes at the same time, which he produced every element of, G-Eazy somehow found time for school as well. He graduated in 2011 from Loyola University New Orleans with a Bachelor of Arts degree in Music Industry Studies. So what I'm saying is, don't call this guy a newcomer. When he takes the stage on Sunday, he will have already had years of experience in every facet of the music industry under his belt. It's all just beginning for G-Eazy, and I can't wait to watch.